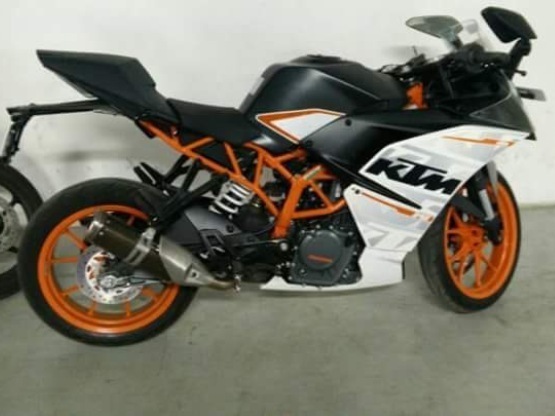 The new 2016 KTM RC 390 has been spotted in India. The new updated version of the bike was unveiled at Eicma 2015, and is expected to make its debut at the upcoming Auto-Expo 2016. The current version of this 390cc bike has received a positive response in domestic market, and the new edition is expected to me meaner and little more aggressive. Visually the bike doesn’t really look like an upgrade except aluminium silencer mounted at the side, replacing the ole underbelly exhaust. It now features Slipper clutch that will help you quickly downshift gears at high speed which usually results rear wheel locking. This new feature will help you avoid doing that. It also has ride by wire technology, this new feature helps you control the throttle of your bike electronically that will get you smoother power and better fuel efficiency. Its disc has been replaced with a new and larger 320mm at front. The new aluminium exhaust system replacing the current underbelly exhausts system to aid fulfil the EURO 4 emission norm. It will have the same single cylinder, 4-stroke 373.2cc engine that produces a maximum power of 43.5Ps at 9,000rpm and 35Nm of peak torque at 7,000rpm. It seems that even in absence of KTM at Auto Expo 2016, we expect the new RC-390 to hit Indian market by mid 2016, with a price tag of INR 20,000 – INR30,000 more than the current models.